Confidence is continuing to grow with regard to the Post-Christmas Snow Storm. All along I have said that I wanted to see the computer forecast models keep the storm in and they have done that with three consecutive runs (Friday night, Saturday morning and Saturday night). It is looking more likely that parts of southeast Missouri, southern Illinois central/southern Indiana, western Ohio and parts of western Kentucky will see measurable snow starting as early as Christmas night through Thursday. There are still a couple things to keep in mind. First, we are still approximately 60 hours away from when the storm will start to get going. 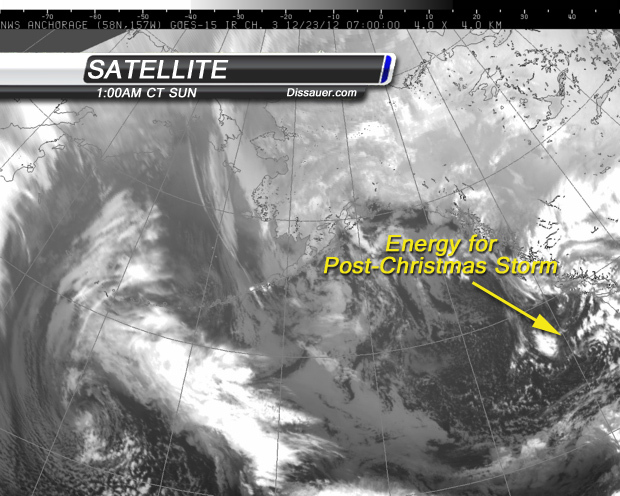 Second, the energy in the atmosphere that will spawn the storm is still in the Pacific Ocean. The above satellite image shows you the location of the wave that will dive down over the Rockies, and if the models are correct, develop an area of low pressure over Texas. Computer model data is in for the Saturday evening runs and NOAA's North American Mesoscale model, the NAM, NOAA's global forecast model, the GFS, and the European forecast agency's model, the ECMWF (Euro) are all suggesting a storm capable of dropping several inches of snow. The question everyone wants to know "How much?" is still yet to be determined. I am a little hesitant to start throwing numbers out. The reason being that a lot of people tend to run with those numbers and think the early "throw out" numbers are the forecast. I do think there is the potential for someone to see 10" to one foot of snow somewhere from central Arkansas to central Indiana. The location of the heaviest snow is nearly impossible to pinpoint right now. The models shifting the projected path by as little as 60 miles can have a HUGE impact on totals. Keep in mind that we are talking 60 miles for a piece of energy that still has over 2,500 miles to travel and make it through the Rocky Mountains. We need to let the computer models sample the energy/wave in the atmosphere over land for a run or two to see if they make in big changes. With the run-to-run consistency of the computer models, I am increasing the "Freak-Out-Meter" to 4 out of 10. I will continue to update the blog when I get a chance today (Sunday). Don't expect to see much in the way of specific snow forecasts for another day or two. This is why you are my fav meterologist!!!!!!! I got online to see if u had any uodates and TaDa!!! You just posted 3 mins ago!!!!! Thanks for the updates!!! I read them all!!! John, you are ruining my Christmas vacation! Well, Mother Nature is...Just worried that the track might veer a little too far south and I can`t get back home when I need to because folks down south don`t have snow removal equipment to clear the roads. Aaaaaggghhhh! I have looked at your blog for a few years, I know personally of the uncertainty of forecasting, remember the freak snow storm that dump over a foot of snow on Carter county MO. Predicting 4-6 inches and it stalled out over Van Buren MO. We revived 9 inches near hunter MO. John, your my favorite meteorologist! You actually tell us the way it's gonna be instead of holding back! I say bring it on, I'll take 10 inches - foot of snow.